By Ajnadin Mustafa and Moutaz Ali. The row between Presidency Council head Faiez Serraj and his two boycotting Council members escalated today when one of them, Ali Al-Gatrani, accused the Council of acting as agents for foreign powers intent on dividing Libya and stealing its wealth. Gatrani was responding to a warning from Serraj that he and fellow boycotter Omar Al-Aswad should resume their duties within a week or the PC would be asking the Libya Dialogue to appoint replacements. In his written response Gatrani demanded that Serraj wake up from what he described as his “political coma”. He said that the PC chief was risking Libya’s security and unity by persistently dealing with some of his fellow council members as if they were employees working for him rather than as partners who represented far-flung parts of the country. Apart from a brief reconciliation, Gatrani and Al-Aswad have been boycotting the PC since January. Al-Aswad is from Zintan and Gatrani from the east. Gatrani, who is close to armed forces commander-in-chief Khalifa Hafter, has accused the rest of the Council of being run by the Muslim Brotherhood. His key objection to the PC and by extension the Libyan Political Agreement, is the transfer of the control of the armed forces from the House of Representatives to the Presidency Council. Although he has not joined in council meetings, Gatrani has sought to exercise some authority, for instance ordering Central Bank governor Saddik Elkaber to quit. That instruction was not heeded. There have been efforts to persuade him that his arguments will be stronger if he resumes his place on the nine-seat PC . 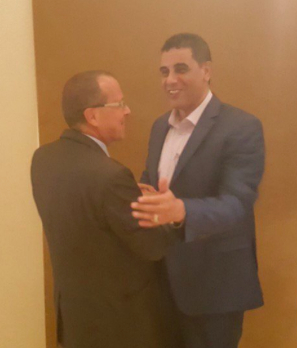 Last month, UNSMIL chief Martin Kobler met him in Cairo and almost certainly tried to bring him back into the Serraj administration. Kobler later described their exchanges as “cordial, frank and useful”. Early reports that Serraj wanted to replace Gatrani and Al-Aswad suggested that he was thinking that the PC itself had the authority to fire them. However, he is working through the Libya Dialogue to seek action against the two boycotters, on the basis that they have not fulfilled the duties assigned them.